Noah K. asks: Who invented braille? Braille was invented by a nineteenth century man named Louis Braille, who was completely blind. Braille’s story starts when he was three years old. He was playing in his father’s shop in Coupvray, France, and somehow managed to injure his eye. Though he was offered the best medical attention available at the time, it wasn’t enough—an infection soon developed and spread to his other eye, rendering him blind in both eyes. While a tragedy for him, had this accident not happened, we wouldn’t have braille today. There was a system of reading in place for the blind at the time, which consisted of tracing a finger along raised letters. However, this system meant that reading was painfully slow and it was difficult to discerning by touch the relatively complex letters of the alphabet. As a result, many people struggled to master the embossed letter system. In 1821, Braille’s teacher, Dr. Alexandre Francois-Rene Pignier, invited a man named Charles Barbier to speak to a classroom of young blind students at the National Institute for Blind Youth in Paris. Barbier had developed a “night writing” system for the military using raised dots after Napoleon requested a system of communication that soldiers could use even in darkness without making any sound in the process. Barbier’s system was too complex for the military and was rejected. However, it was thought that it might be useful for the blind, which led Dr. Pignier to invite Barbier to come demonstrate it. As it stood, the Barbier invention wasn’t quite up to functioning as a system of touch-based reading and writing, being overly complex (using a 6×6 dot matrix to represent letters and certain phonemes). Further, this large dot matrix made it so unless you had very large fingertips, you couldn’t feel all the dots in a single matrix without moving your finger. Still, Braille was inspired and, as a young teenager, he began experimenting. He took a piece of paper, a slate, and a stylus, punching holes and attempting to find something that worked. In 1825, Braille was just barely sixteen, but he thought he had hit upon something that was functional and superior to the existing embossed letter system. His original code consisted of six dots arranged in two parallel rows, each set of rows representing a letter. This configuration was simpler than Barbier’s system, but still versatile enough to allow for up to 64 variations, enough for all the letters of the alphabet and punctuation. It was also easily adapted to languages other than French. 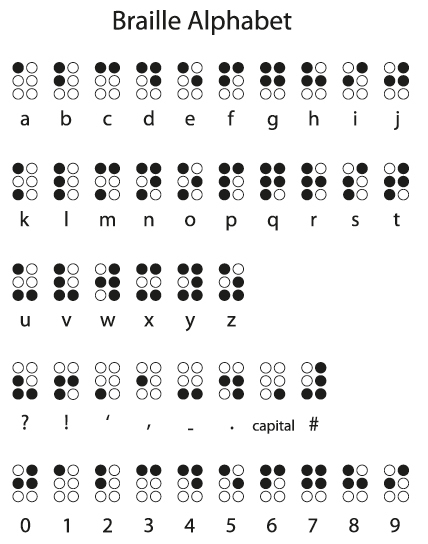 Most importantly, rather than needing to trace out a whole letter, it was much easier to feel the configuration of dots, making reading for the blind significantly faster and easier. Dr. Pignier was pleased with Braille’s work and encouraged his students to use Braille’s new system. Unfortunately when Dr. Pignier introduced The History of France written in braille for his students, he was dismissed from his position as headmaster, due to his insistence on pushing Braille’s system rather than the standard embossed letter system of the day. Nonetheless, Braille himself became a teacher at the Institute and taught his code to the students who passed through, spreading the knowledge. In 1834, when Braille was in his mid-20s, he was invited to demonstrate the uses of braille at the Exposition of Industry, which was being held in Paris that year, further spurring its popularity. By this time, Braille had also published a book about how to use the code. 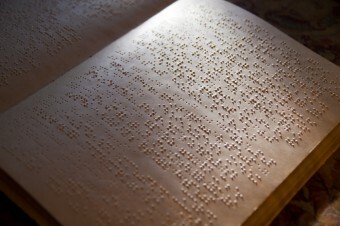 It was mostly written in embossed letters with braille thrown in to demonstrate its use. Despite this, the National Institute for Blind Youth that Braille worked at still refused to officially adopt his system. It wouldn’t be until 1854, two years after Braille died and eight years after a school in Amsterdam started using it as their primary reading/writing system, that Braille’s former school finally adopted braille due to students overwhelmingly demanding the change. By the late nineteenth century, braille had been adopted throughout most of the world, excepting the United States, who held out until 1916. These days, books for the blind in English are typically written in Grade 2 braille. It is a system that combines letters and substitutes letters for words. For instance, the letter “y” is used to represent the word “you” and the letter “b” represents the word “but”. In some respects, Grade 2 braille is a lot like “chatspeak” and takes shortcuts to make for an easier reading and writing experience. In addition to taking a shorter time to read, it also takes up less space, saving paper used on braille books. Today, English speaking blind children are mostly taught Grade 2 braille, though Grade 1 braille (every letter written out) is still sometimes taught in early elementary school. There is also a Grade 3 braille for any non-standard shorthands. Braille also developed a system known as decapoint. Decapoint configurations more closely resemble letters, making it easier for sighted people to read it. He even helped develop a machine that would make decapoint easier to write, so that the dots didn’t have to be hand-written with a stylus. It was called a “raphigraphe,” and it was developed with the help of Pierre-Francois-Victor Foucault in the late 1830s and early 1840s.